on duty in the Malayan campaign circa 1951. THE HEROIC actions of two dogs will be honoured by leading veterinary charity PDSA next week (February 6), with the presentation of the PDSA Dickin Medal, the Animals' Victoria Cross, by PDSA Patron, HRH Princess Alexandra, at a special ceremony to be held at the Imperial War Museum, London. The PDSA Dickin Medal will be presented to eight-year-old black Labrador, Sadie, a Royal Army Veterinary Corps (RAVC) arms and explosives search dog, for her gallant exploits in Afghanistan, and posthumously to German Shepherd, Lucky, a Royal Air Force (RAF) Police tracker dog, on behalf of the four RAF tracker dogs that tirelessly worked in the Malayan jungle between 1949 and 1952. The PDSA’s Dickin Medal is the highest award any animal can receive in recognition of conspicuous gallantry and devotion to duty whilst serving in military conflict. Lucky's posthumous award will be accepted by RAF war veteran Corporal Bevel Austin Stapleton, the loyal German Shepherd's handler and partner. 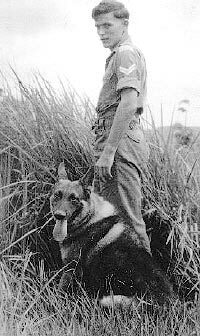 During the Malaya Campaign, Lucky and his canine colleagues, Bobbie, Jasper and Lassie were instrumental in the capture of hundreds of communist terrorists including the notorious gang leader Lan-Jang-San in February 1951. This one terrorist was responsible for the death of many local people. The determination and jungle tracking skills of the four dogs lead to his capture, preventing further casualties. 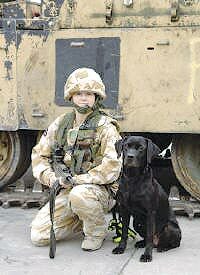 RAVC search dog Sadie, will be accompanied at the ceremony by her handler, Lance Corporal Karen Yardley. They have worked together for two years and completed two tours of duty in Afghanistan. In November 2005, Sadie located a booby-trap bomb concealed in a pressure cooker. The bomb was concealed behind a two-foot thick concrete blast wall within the United Nations compound in Kabul, Afghanistan. It was packed full with high explosives and attached to a remote-control detonation device. Sadie's discovery saved possibly hundreds of soldiers and civilians from death and serious injury. Sadie and Lucky will bring the total number of PDSA Dickin Medals presented to animals in war to 62. Since the introduction of the award by PDSA's founder Maria Dickin CBE in 1943 it has been awarded to 24 dogs, 32 World War II messenger pigeons, three horses and one cat.